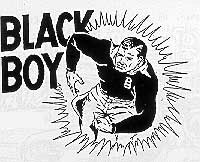 Black Boy is the son of Fantax, Horace Neighbor, Jr. His father, drawn older, makes occasional guest appearances. Black Boy rides a souped-up red motorbike and fights crime. Wri: E. Roos; Art: Remy Bordelet. 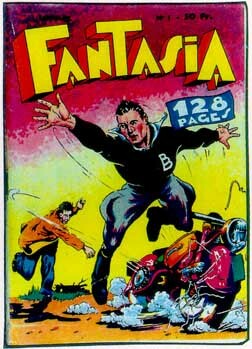 Black Boy was an attempt by Mouchotte to resurrect Fantax, killed by French censorship. By removing the mask, and focusing on more "mundane" stories -- many plots involve crime rings, spies and saboteurs -- Chott thought that he would escape the wrath of the censors. 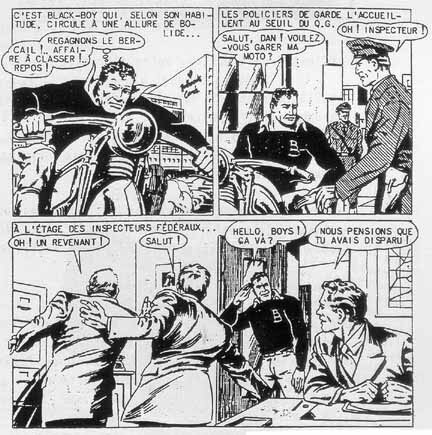 After the character was launched it was entrusted to the talented Remy Bordelet (who had already collaborated on Fantax) and to Francis Peguet. Actor Lino Ventura was a clear inspiration for Black Boy's likeness.